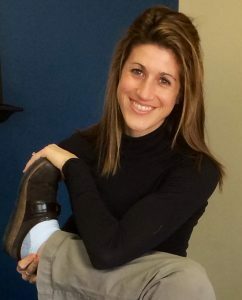 We are delighted to announce that Hampton Physical Therapy’s owner, Dr. Kate Serodio, PT, DPT, OCS has been awarded a board certification in orthopedics by the American Board of Physical Therapy Specialties (ABPTS). Only 1% of all physical therapists hold this prestigious Board Certified Orthopedic Specialization (OCS). Serodio is one of only 46 orthopedic clinical specialists in New Hampshire. Research has indicated that therapists with this certification are able to achieve improved outcomes within less time than therapists without certification. Certified specialists such as Dr. Serodio have clearly demonstrated their commitment to service by the variety, depth, and consistency of their professional involvement. Their desire to attain formal recognition of their advanced clinical knowledge, competence, and skills reflects their devotion to their profession and their patients. All physical therapists at Hampton Physical Therapy are dedicated to providing the highest quality physical therapy services available.